Growing up there was one, just one thing I could do faster than all the other kids--turn the page. I could read like nobody's business. So while pretty much anyone could go home-to-first or basket-to-basket or a quarter mile quicker than I could, I didn't care. I'd be busy reading them under the table. Perhaps hiding under one. But that's not the point. That didn't stop me from loving baseball. Or helped me love losers at baseball, the Mets. While a year older than I am, they've only won two World Series in my lifetime, one I don't really remember (hey, what did you do when you were six?). But I got obsessed and it's still my favorite sport to the point I sort of tolerate that there are other sports in inverse relationship to how much good writing there is about them. Not longer after the baseball bug bit, I discovered the joys of drinking. Which, of course, sounds wrong, but I've been always interested in a cut above my station and the drinking age was still 18 then. Living up in New Jersey my family would do things like occasionally go to a New York City dinner at the Rainbow Room, so maybe I got Art Deco and Fred and Ginger (who I didn't learn about really until grad school) and martini glasses all confused with my first beef Wellington and Manhattan (the island and not the cocktail) twinkling below. Who knows. But I was into import beer when that merely meant Heineken and Bass (remember those pre-adventurous days? ), and somehow, well, no doubt a how aping my dad, into Scotch at 15. Not like every weekend, but I can remember one New Year's Eve with a bottle of Black & White and those cute doggies on the label and discovering for the first time in my life the perfect pitch of buzzed not sloshed. That's a halcyon spot I've hankered for more than I've cared to admit since. So, look at this. 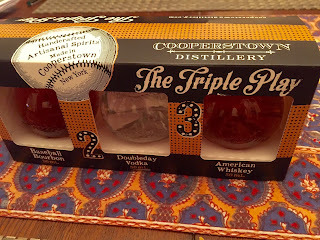 There's a distillery in Cooperstown. (Why not, what town now doesn't have one?) But you can get a sampler called "The Triple Play" and it's got bourbon, vodka, and whiskey in 50 mL bottles shaped like little baseballs. This is a halcyon spot of Tom Seaver's knee dirty with full extension as his slider strikes a bum like Pete Rose out, of Darryl Strawberry's amazing Stretch Armstrong limbs knocking the snot out of a pitch, of Johan Santana, his arm basically a rubber band wearing down, finally tossing the club's first no hitter after 8000 games. And craft liquor. Sure I'm going to review this stuff, but more than anything I want to praise its brilliance as marketing genius to at least one middle aged man. And when I empty a bottle I only wish I still had my Pitchback and try to pretend I could drop a curve on the outside corner just like fellow lefty Jon Matlack could, back in 1973 when I learned the fun of comebacks, underdogs, hope that wasn't mere smoke. When I also learned never to give up, and to lose (damn A's! ), and to cry, and then there's tomorrow. To think I did all that without whiskey, even.